After more than 30 years of honorable service to the fleet, USS McInerney (FFG 8), the longest-serving Oliver Hazard Perry-class frigate in the U.S. fleet, officially decommissioned during a ceremony held at Naval Station Mayport Aug. 31. The ship was then commissioned as PNS Alamgir (F-260) in the Pakistan navy. As McInerney Sailors manned the rails, the order to secure the watch and haul down the colors was announced. Soon after, the U.S. Sailors departed the ship for the last time and Cmdr. Paul D. Young, McInerney's commanding officer, transferred command to Capt. Naveed Ashraf of the Pakistan navy. Alamgir then hoisted their country's flag and played the Pakistan national anthem. This was the first hot ship transfer between U.S. and Pakistan. This transfer of vessel occurs right after a ship decommissions and is immediately commissioned under the new flag. 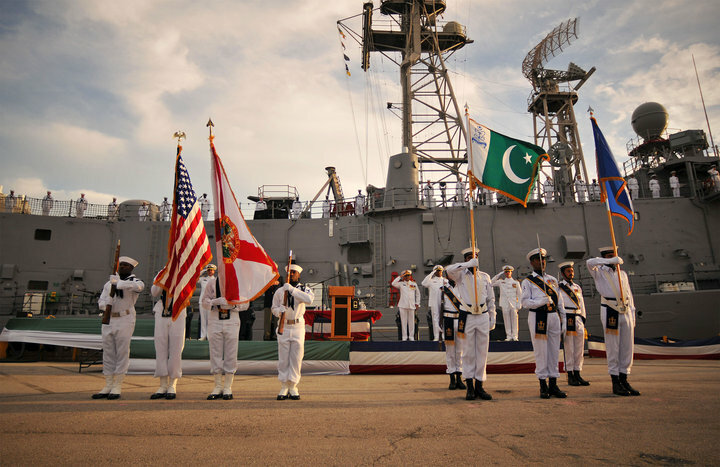 "McInerney has had a long line of firsts in its rich history and this is a very important one that will have lasting impact on our Navy as well as the Pakistan navy," said Young. "This occasion was heartfelt and I'm going to miss the crew, the ship and everything that came with it." After Alamgir undergoes a dry dock and pier side refurbishment, the ship and crew will leave the United States for Pakistan. The ship will improve the Pakistan navy's ability to safeguard territorial waters. Alamgir could also serve as part of the multinational task force conducting maritime security operations in and around the Strait of Hormuz, Gulf of Aden, Gulf of Oman, Arabian Sea, Indian Ocean and the Red Sea. 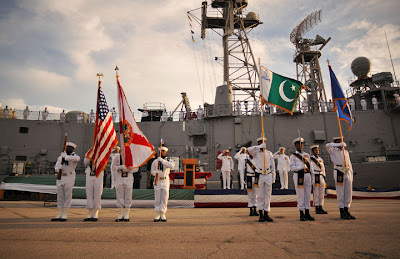 The Pakistani crew has been training with the U.S. Navy crew between May and August 2010. The crew will continue to receive specialized training on the ship's engineering, navigation and combat systems while the ship is being refurbished. McInerney's advanced systems and technology combined with a highly skilled crew and professional leaders set her apart as one of the most capable ships in the fleet. McInerney was the second ship of the Oliver Hazard Perry-class of guided-missile frigates and was commissioned on Dec. 15, 1979. In September 2008 the US Congress approved selling the frigate to Pakistan with a delivery date of August 2010. Citing the Foreign Assistance Act and the Arms Export Control Act, Pakistan is considered a "major non-NATO ally", able to receive older unneeded US military equipment. Additionally, the 32-year old frigate will be given a US$65 million refurbishment including anti-submarine capability paid for with foreign military aid provided by the U.S. to friendly countries. Stripes.com reported last year that once transferred to Pakistan, the ship will join Combined Task Force 151, the multinational force aimed at fighting piracy in the troubled waters of the Gulf of Aden, Arabian Sea and Indian Ocean. It also added that over the past 10 years, the US Navy has transferred 23 ships, including minesweepers, patrol craft and tugboats to other countries, including Greece, Turkey, Egypt and India.